Whitefish Point is one of many great places and tourist attractions in Paradise, MI. A video tour of the Great Lakes Shipwreck Museum, Whitefish Point & Bird Observatory and the unique freshwater sand dunes found only in Michigan. Bring the whole gang to Whitefish Point this summer, a National Historic Site marking the vital entry way to the icy waters of Lake Superior and featuring an 80-mile stretch of rugged shoreline that has earned it the ominous title as "Lake Superior's Shipwreck Coast." We suggest a visiting time of 3-5 hours. Whitefish Point is the location of the Great Lakes Shipwreck Museum that will allow you to visualize the ultimate beauty and power of Lake Superior as never seen before. The museum is open every day from May to November, 10am to 6pm. During your visit, museum staff and interpreters are always ready and willing to answer any questions you may have about the historical significance of Whitefish point or the many artifacts found within the Shipwreck Museum. The museum is dedicated to the perils of nautical travel in the Great Lakes, and is the only museum of its kind. Inside you will learn why Lake Superior has earned the reputation as being the most treacherous of all the Great Lakes, home to ice water mansions and sunken ships galore. Throughout the gallery you will see exhibits and artifacts including the bell from the renowned Edmund Fitzgerald, a memorial to the sailors and ships that were lost to the waters of Superior. Whitefish Point features a guided lighthouse tour of Michigan's oldest active lighthouse on Lake Superior, fully restored and initially constructed in 1861. On the tour you will hear first hand accounts of the different lighthouse keepers and their families who have manned the duplex style building while tending the light. See period furnishings, artifacts and expressive panels that have been salvaged from the days of the U.S. Lighthouse Service. In addition to the museum and lighthouse, Whitefish Point also offers a bird observatory documenting the chronology and quantity of migrating birds through the Whitefish Peninsula Migration Corridor. Large concentrations of migrating birds like Michigan songbirds, raptors and water birds pass through the Upper Peninsula every year. The Migration corridor features natural terrain that attracts thousands of birds every spring and fall, making for spectacular bird watching and providing tremendous opportunities to study and monitor bird populations. About 53 acres of Whitefish Point make up part of the Seney National Wildlife Refuge. Theis are of Whitefish Point includes gravel beaches, sandy beach dunes and stunted jack pine-dominated forest. Over the years, numerous small foot paths have been carved on the landscape. While this may allow you to get a closer look at birds, the dune habitat is very fragile and easily damaged. Please stay on current trails and off the dunes. A large portion of the beach area is designated as critical habitat for the Piping Plover, an endangered species. Please obey all signs and respect any beach closures to protect nesting Piping Plovers. 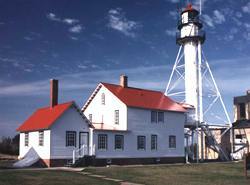 The US Fish and Wildlife Service's website has more information about the Whitefish Point National Wildlife Refuge. If you have new or updated information about Whitefish Point, please contact us.